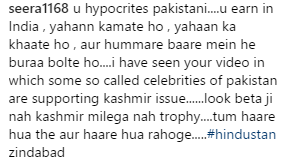 India Vs Pakistan Finals: Ali Zafar Shares Video In Support Of Pakistan, Indians TEACH Him Right Lesson! 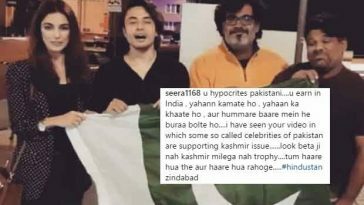 Ali Zafar, who was last seen with Ali Bhatt in Dear Zindagi, took to Instagram to share a video in support of Pakistan. The video sees him hooting for Pakistan along with his friends and guess what? Indians did not spare him as soon as the video was uploaded. He was given left, right and center and Indians made him realize that how for getting work in Bollywood he uses India. Well, India has banned Pakistani artists from working in Bollywood and we think, it is the best decision ever. Dear Ali Zafar, there is nothing wrong in promoting your country but make sure that you are not using India to get work and earn your lavish living. We hope you to be ‘man of words’. Also Read: Is Daddy Saif Ali Khan Not Happy With Daughter Sara Ali Khan’s Debut Opposite Sushant Singh Rajput?